Project management is an evolving profession. Originally considered part and parcel of the design function, the practice of project management has evolved into a separate classification of professional practice. Professional project managers of today use sophisticated computer programs to achieve in seconds what took days to accomplish and evaluate in the past. Cost estimating and project scheduling have become key elements in assuring on-budget and on-time delivery of final projects. Key to those is how well the project manager addresses environmental issues that arise. Those issues need to be considered from the planning stages of a project to the end-of-life stages of the project and the disposal of the remnants of the project decades in the future. 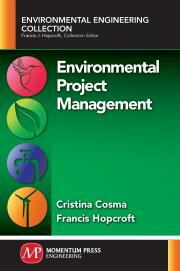 This book describes, in concise terms, using easy to follow examples, the various aspects and considerations required in effective project management and the tools that can be used by a nonprofessional project manager to appropriately evaluate how well the professional is doing or effectively manage smaller projects without the need for a professional project manager. Cristina Cosma was born in Romania where she was raised and schooled, including her undergraduate and graduate work, before moving to the United States to teach construction management. She is a citizen of Romania, with permanent resident status in the United States. She currently teaches construction management at Wentworth Institute of Technology in Boston, MA. Cristina holds a PhD in civil engineering from the University of Florida and she is a registered professional engineer.